A patellar tendon rupture is a painful and serious injury in sports. It is the tendon that extends from the bottom of the patella to the top of the tibia, and along with the quadriceps muscle, the quadriceps tendon, and the patella (kneecap), it serves to extend the knee. A traumatic injury is almost always required to tear the patella tendon. This is not an injury that occurs over time. There has been speculation that people with long-standing patella tendinitis or have been taking a certain class of antibiotic might be more likely to suffer a patella tendon rupture, but almost always this is an acute event. There are many ways an athlete can tear his patella tendon, such as landing awkwardly from a jump. The athlete will know immediately that a serious injury has occurred. He or she will be in a tremendous amount of pain, and he or she will usually be unable to walk or even extend than knee. An athletic trainer or physician on site can usually diagnose the injury by feeling a defect where the patella tendon should be. Often the kneecap will pull back higher than it normally sits due to the disruption of the tendon that links it to the top of the tibia. 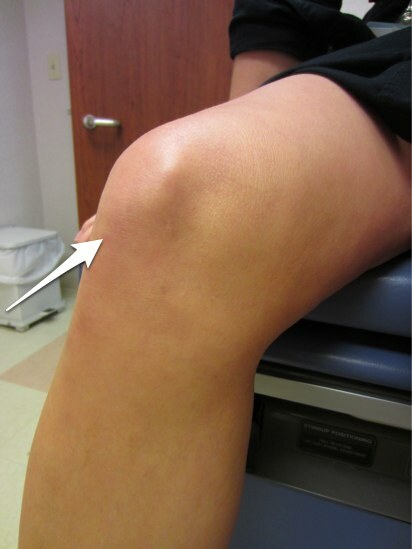 The knee will be very swollen, and the athlete will have significant pain at the location of the injury. X-rays are usually normal. Although the diagnosis is fairly straightforward just by history and physical examination, sometimes a physician will order an MRI in high-level athletes to confirm the diagnosis as well as rule out any other injuries that occurred at the same time. Surgery is almost always required for this injury. The tendon does not typically heal on its own. It is an outpatient procedure in which an incision is made over the torn tendon to expose the tear. Stitches are placed in the tendon, and the stitches are passed through drill holes in the patella to anchor the tendon to the patella. The knee will then be placed in some sort of immobilization, such as a cast or a knee brace that holds the knee straight. Keeping the knee straight for a certain amount of time prevents stress on the repair of the tendon while it heals. Over the next few weeks, knee motion is started slowly while still trying to protect the healing tendon. When full motion is restored, more active strengthening of the muscles around the knee is started. Running and then sport-specific drills follow. The entire surgery and rehabilitation process can take 3 to 6 months, so this is almost always an injury that ends the athlete’s season.